Dave Blaney picked up the 15th last-place finish of his career in Sunday’s Aaron’s 499 at the Talladega Superspeedway when his unsponsored #66 PRISM Motorsports Toyota fell out with rear gear problems after he completed 33 of the race’s 200 laps. Blaney was switched back to PRISM’s #66 as Talladega marked Michael Waltrip’s one-off appearance as driver of the team’s #55. When a severe storm warning in the Talladega area cancelled qualifying on Saturday, both cars made the field: Blaney got the 42nd starting spot with Waltrip in 43rd. On Sunday, Blaney pulled behind the wall under green just a few laps after the first competition caution on lap 20. Waltrip and his Aaron’s-sponsored ride contended for the lead with former teammate Dale Earnhardt, Jr. before a wreck on lap 84 took him out of the race. The race marked the fourth consecutive last-place finish for PRISM Motorsports between its #55 and #66 teams. It is Blaney’s second consecutive last-place finish and first at Talladega. It was the first time both the #66 and PRISM Motorsports had ever finished last in a Sprint Cup race at Talladega. No Cup driver had ever finished last at Talladega due to a rear gear problem. Blaney broke his tie with Joe Nemechek for the most last-place finishes in the Car of Tomorrow. He is now tied with Ward Burton and the late J.D. McDuffie for the second-most last-place finishes since 1972 and is tied with Richard Petty, among others, for the sixth-most all time. Michael McDowell picked up the 4th last-place finish of his career in Saturday night’s Subway Fresh Fit 600 at the Phoenix International Raceway when his unsponsored #66 PRISM Motorsports Toyota fell out with overheating problems after completing 149 of the race’s 378 laps. 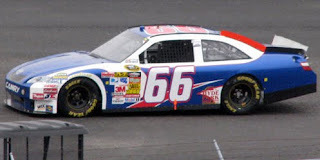 Two races after McDowell had surrendered his seat to Michael Waltrip at Bristol, McDowell and teammate Dave Blaney switched rides at Phoenix in another attempt to get PRISM Motorsports’ #55 team ready for Waltrip’s run at Talladega. It was decided that Blaney would run more laps than McDowell, so Blaney was selected to put McDowell’s #55 through its paces. Ironically, in Friday’s opening practice session, it was McDowell who stole the show by scoring the second-fastest lap (behind Denny Hamlin) in Blaney’s #66. In qualifying, the disparity remained; McDowell qualified 12th at 133.136 mph while Blaney could only manage 31st. A report at NASCAR.com confirmed, however, that McDowell’s #66 was still not prepared to run the entire race, citing the team’s continued lack of top-quality race equipment. As Saturday’s race began, both McDowell and Blaney found themselves in an unusually-competitive battle for last place. McDowell and Daytona 500 last-place finisher Joe Nemechek were the first cars behind the wall during the third caution on lap 56, but both returned to the track in the next 10 laps. Blaney followed suit some time later, as did Max Papis and Johnny Sauter, who was running a second car for Tommy Baldwin Racing. By lap 98, all five cars were back on the track running from 37th to 41st: Nemechek and Sauter were 8 laps down, Blaney down 12, Papis 17, and McDowell 31. At this point, 42nd and 43rd were still held by Brian Vickers and Kasey Kahne, who were both involved in separate early-race accidents. Interestingly, it was during these two cautions that both Blaney (lap 18) and McDowell (laps 59-62) stayed out to lead and gain 5 bonus points. Both Vickers and Kahne returned to the track before the halfway mark with Kahne 43rd, 99 laps down, and Vickers 42nd, 87 laps back. On lap 129, an extended stay behind the wall slipped Sauter to 40th while another by Blaney dropped the #55 down the rankings as well, moving Papis up to 38th. On lap 188, the fifth caution fell for fluid on the track that supposedly came from a failing rear gear on Blaney’s #55. Both Blaney and McDowell pulled behind the wall under the caution while Sauter remained on the track. On lap 245, both McDowell and Blaney were listed out of the race with McDowell 42nd and Blaney 40th. Kasey Kahne finished the race under power, denying him his first last-place finish. With 124 laps to go, Kahne passed McDowell for 42nd, then passed Blaney 11 laps later, dropping the defending LASTCAR champion to 42nd. Sauter, Papis, then finally Nemechek would all fall out by race’s end. Nemechek ended up missing the Bottom Five with a 38th-place finish and 281 laps completed. The race marked the first time the #66 had finished last since Blaney set the LASTCAR driver’s season record with the team in last fall’s Chevy Rock ‘n Roll 400 at Richmond. Neither McDowell nor the #66 had ever before finished last at Phoenix. McDowell himself was the most recent driver to finish last with overheating problems when his #36 Wave Energy Drink Toyota fell out of last year’s Ford 400 at Homestead. McDowell is not only the highest-qualified last-place finisher of 2010, but the first to start in the top 20. It was the most laps ever completed by a last-place finisher in a Sprint Cup race since Kurt Busch crashed out of the 2008 Ford 400 at Homestead after completing 207 of the 267 laps. No last-place finisher since then had ever completed more than 79 (Joey Logano, 2009 Daytona 500). The four laps McDowell led were the first by a last-place finisher in 2010, the first by any last-place finisher since David Gilliland’s single lap in last summer’s Autism Speaks 400 at Dover, and the most laps led by one since Martin Truex, Jr.’s 27 laps in the 2008 Camping World RV 400 presented by Coleman at Kansas. As NASCAR continues to run the Car of Tomorrow platform with the rear spoiler, I will continue to update these rankings at this link, which can also be viewed under the "Current Last-Place Rankings" menu on the right side of this page. Michael McDowell's last-place finish at Martinsville has already been added.